WELL, IT’S CHRISTMAS Eve and that means one thing and one thing only. However, there is still a bit of time until the main man himself arrives in Ireland. Thankfully, due to the wonders of the internet, it’s very easy to track Santa as he travels across the world before he finally arrives here. Here are two of the best ways to stay updated. The NORAD (North American Aerospace Comment) Santa Tracker is the longest running Santa tracker in the world – it’s been in existence since December 1955. Here’s a quick history of the NORAD tracker. Every year on Christmas Eve, NORAD tracks Santa from the moment he leaves the North Pole and delivers presents to children around the world. As NORAD has spent so many years tracking Santa, it has built up a huge database of facts and statistics about Santa’s work and equipment. Teaming up with Microsoft and a number of other companies, the website offers games, videos and other activities to keep the whole family entertained. NORAD has apps on iOS, Android and Windows Phone to keep you up to date if you don’t have a computer handy. 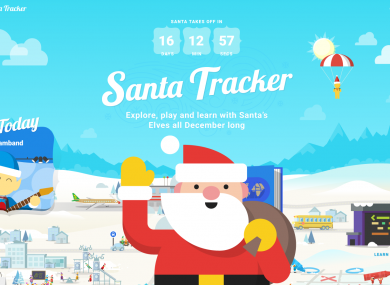 The second option to track Santa as he makes his journey around the world tonight is the Google Santa Tracker. It uses Google Maps and their extensive data on sleigh engineering (along with a bit of help from Santa’s very own magical elves) and it’s a far more colourful and animated way of tracking him. Alongside the website, Google also offers an Android app to keep up to date with Santa’s progress if you’re out and about this evening. Both the website and app options have a large number of games and activities to keep the kids entertained. No matter which of the above options you choose, both will most definitely keep the younger children entertained as the excitement builds before Santa arrives. But, just remember – once he does arrive … it’s CHRISTMAS! Email “Do you want to track Santa's trip around the world tonight? Here are a few options”. Feedback on “Do you want to track Santa's trip around the world tonight? Here are a few options”.